I love beans. And these savory navy beans are near the top of my list. Rosemary. Thyme. Parsley. Onions and garlic. Shallot. What’s not to love? I also love how the house smells when I cook this. It’s a meal in a bowl. A stew really. Nourishing. Satisfying. Just good. It flips from vegan to not with two ingredients. Make it vegan or add the optional bacon and chicken stock and it will satisfy the most carnivorous palate. It isn’t even that much bacon. Just a hint really. Less than a slice per serving. Even with the bacon it’s pretty healthy. It’s gluten free too. Not by design mind you. It just worked out that way. It’s easy too. If you use canned beans you can get these savory navy beans on the table in about 40 minutes. Most of that time is simmering time. Walk away from the stove time. Leftovers make great lunches too. It reheats nicely in a microwave. If it sounds good to you, try it. I think you’ll like it. You may even love it. I do. 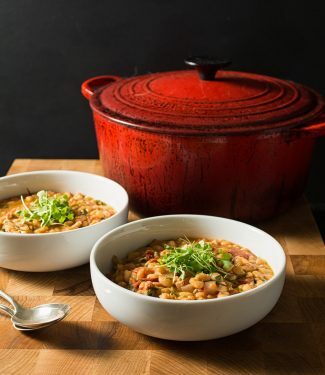 Savory navy beans are a delicious, one pot meal that can be on the table in less than an hour. Make them vegan or not - either way they are sure to please. If cooking dry beans, add the bay leaves to the cooking liquid. Add oil to a pot large enough to hold all the ingredients. If using the bacon, fry it in the oil, then proceed with the recipe. Gently saute the onion and shallot until translucent and soft. Add the beans, tomatoes, stock, rosemary, thyme and bay if you didn't cook the beans with the bay. Stir in the stock and simmer for about 30 minutes. Mix in the parsley, lemon juice and crushed chili. Serve in bowls drizzled with your best olive oil if you like. In american, french, main course, meat, pork, soup, Vegetarian. Bookmark the permalink. Yay navy beans!! I’m a big fan of navy beans. They’re definitely underutilized in the culinary community, so I was SUPER excited to see this recipe! It looks so delicious and easy! A giant pot of beans ready in less than an hour with minimal clean up?? Yes, please! Can’t wait to make this! I’m so glad. I always make a big pot as it makes for great leftovers. I hope you like it! I’ve only ever had sweet baked beans or pinto beans, so this would be a new one for me. It looks delicious! I would happily eat this on it’s own for lunch or as a side dish for some roasted meat. Pinning to make soon!! I love it as dinner on its own and make extra for lunches. You are right though. It would go nicely with a roast pork. These beans look fantastic! It’s so funny, for some weird reason, never really think about seasoning my beans. The seasoning here is on point! More spice is good spice! Yum, I’m thinking this looks like the perfect side for barbecued meat! I love the option to add some smoky bacon in there, too. All kinds of yummy flavors going on with this one! 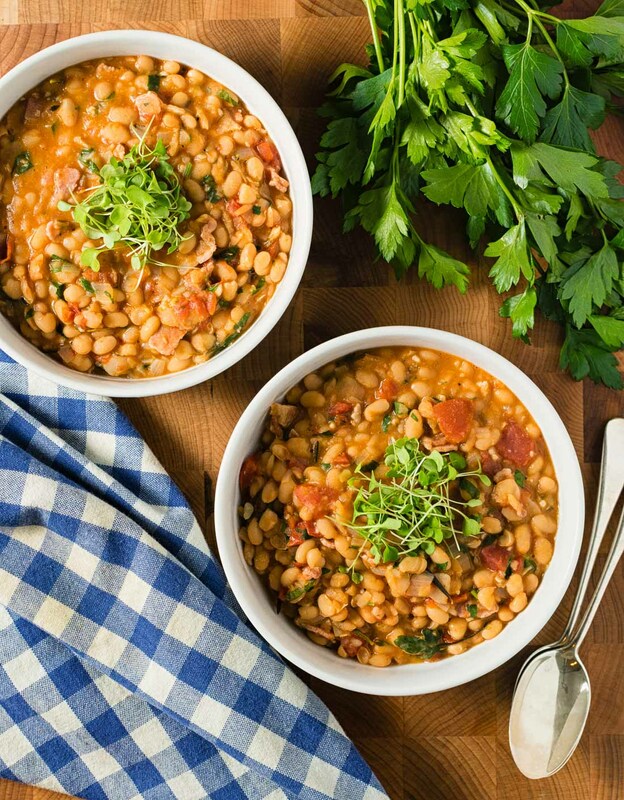 These savory navy beans sound wonderful! Just what we need here in this cold weather! I don’t always have fresh herbs on hand, especially in the winter, do you think substituting dried thyme and rosemary would be acceptable occasionally? I don’t actually know what they would be like with dried herbs. This recipe is really about the taste of fresh. I’m sure it would be good – it would just be very different. Made these today — ah-maz-ing! Meant to save them for an easy dinner, but fortunately it’s a nice, big recipe so daughter and I were able to sneak a bowl for lunch. Definitely a keeper. The fresh herbs really make it. So glad you liked them. The fresh herbs just kick it up to something special. I like bringing them to work for lunch. I get a lot of comments about how good the aroma is just coming out of the microwave.